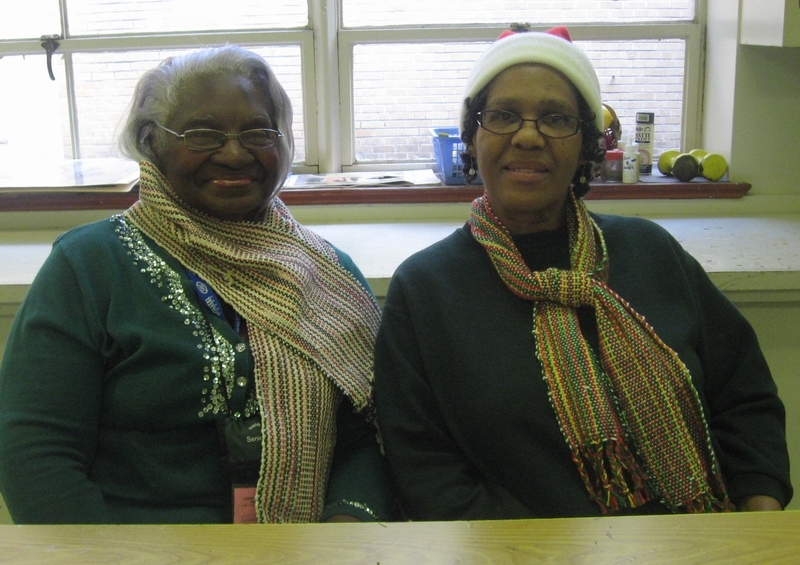 For five years, I had been teaching weaving to senior citizens through Creative Aging Mid-South. The students I have worked with often express their creativity through their lifelong passions and experiences. Students’ abilities have ranged from the completely independent and self learning individuals to those with dementia who require a fair amount of assistance and guidance toward the completion of their projects. 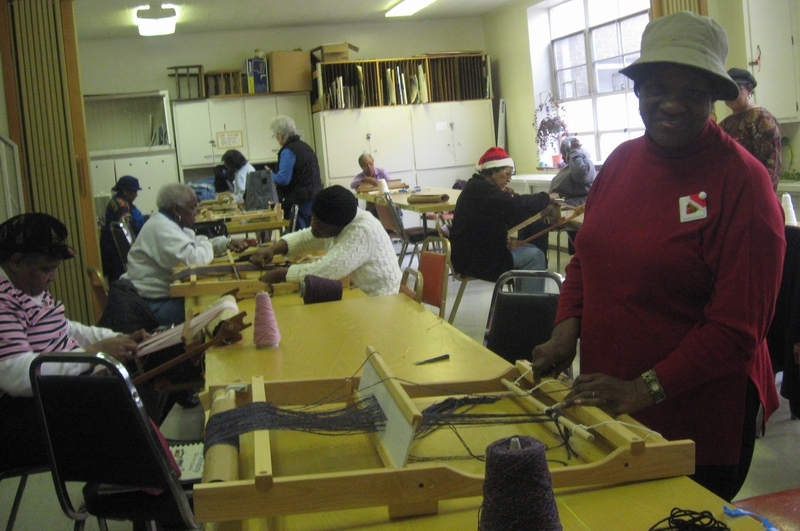 When I work with individuals demonstrating decreased levels of cognitive functioning due to dementia, disease or other illness, I need to structure the project so that the many steps of weaving are broken down into a limited number of tasks with a repetitive element. 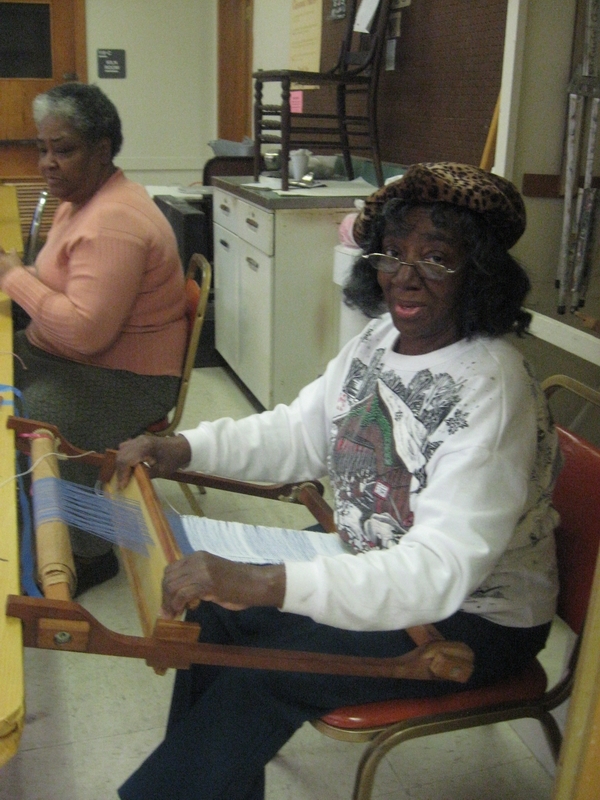 For instance, residents of an Alzheimer’s or dementia program will more easily remember the repeated rhythmic chants of “under, over, under, over” than trying to remember the many steps of weaving with a frame loom such as “raise the heddle, insert the shuttle, beat, lower the heddle, insert the shuttle, beat” and so on. 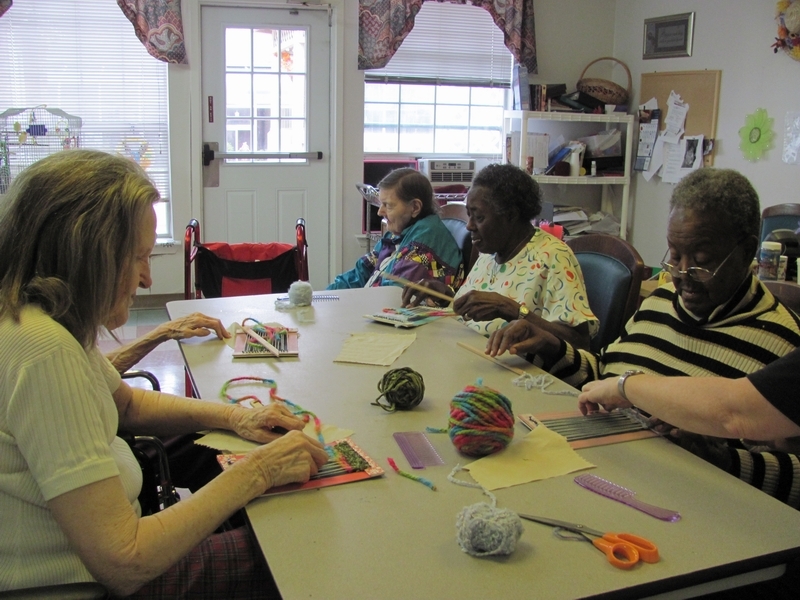 In fact, many of the individuals with cognitive impairments will remember the under and over motion of weaving on a potholder loom, either from their own childhoods or from teaching their children. 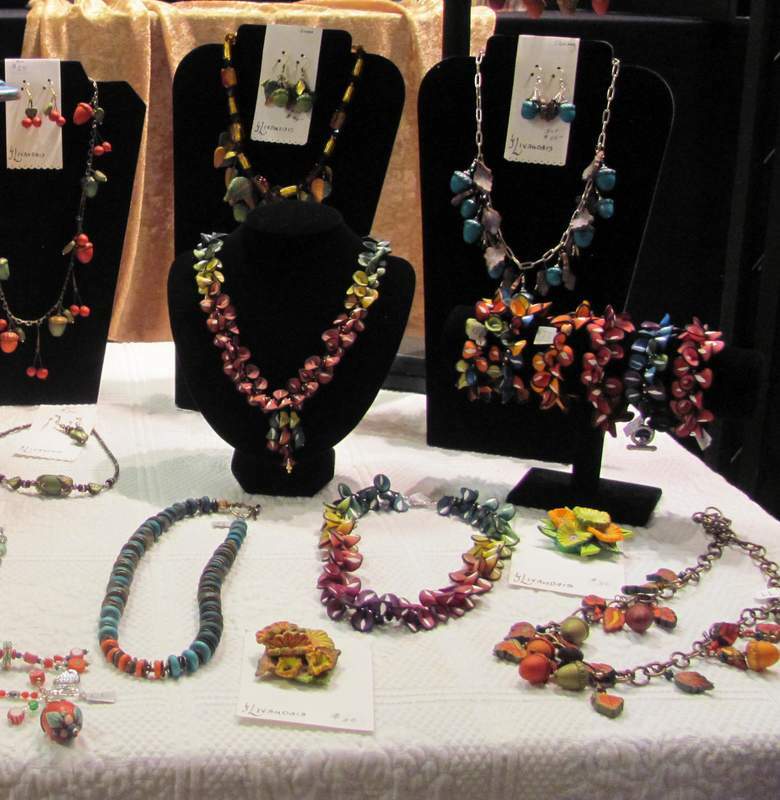 In previous classes offered to dementia groups, I taught weaving on a simple frame loom, or on a cardboard loom where the finished project had to be removed in order to be displayed or worn, such as a woven pendant or necklace. This meant that the students needed to finish their projects before the piece had to be removed. 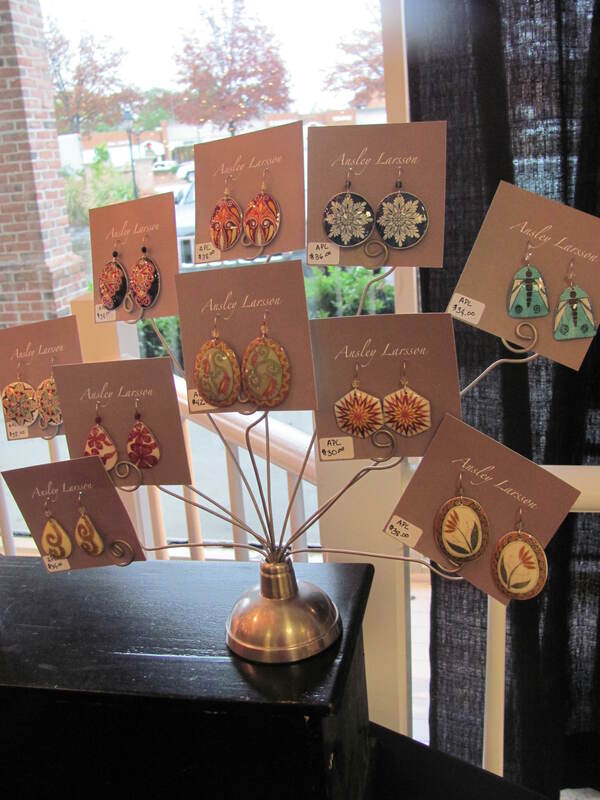 More often than not, I was the one who ended up having to finish their projects and then preparing them for display or to be worn. In this way, the art work became a piece woven by me and not by the students! And so I had to remind myself to KEEP IT SIMPLE, STUPID! For my current class with a group of residents in an assisted living facility which housed an Alzheimer’s unit, I referred to this book for inspiration. 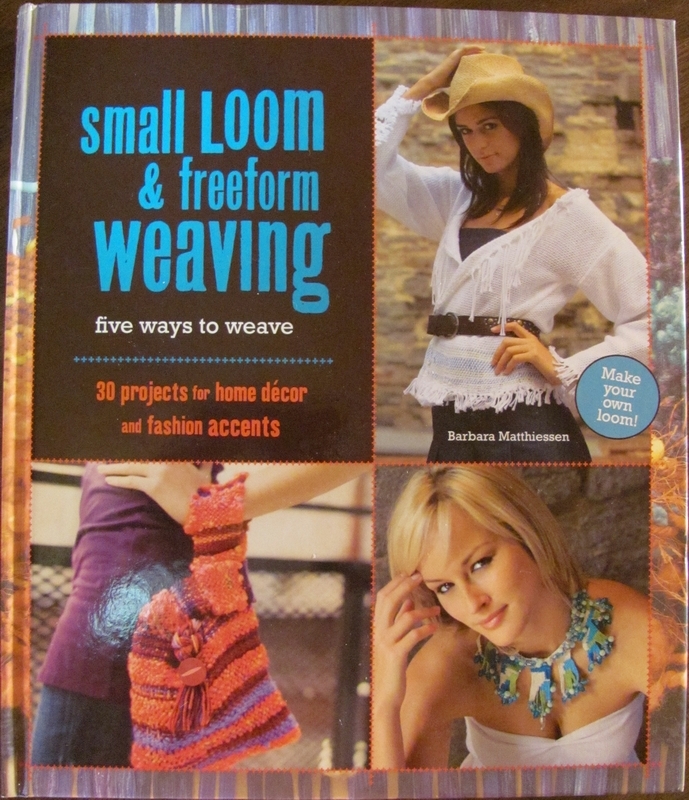 The author of Small Loom and Freeform Weaving used the discarded cover of an old book as a loom to weave a non-traditional piece with open spaces in the weaving. 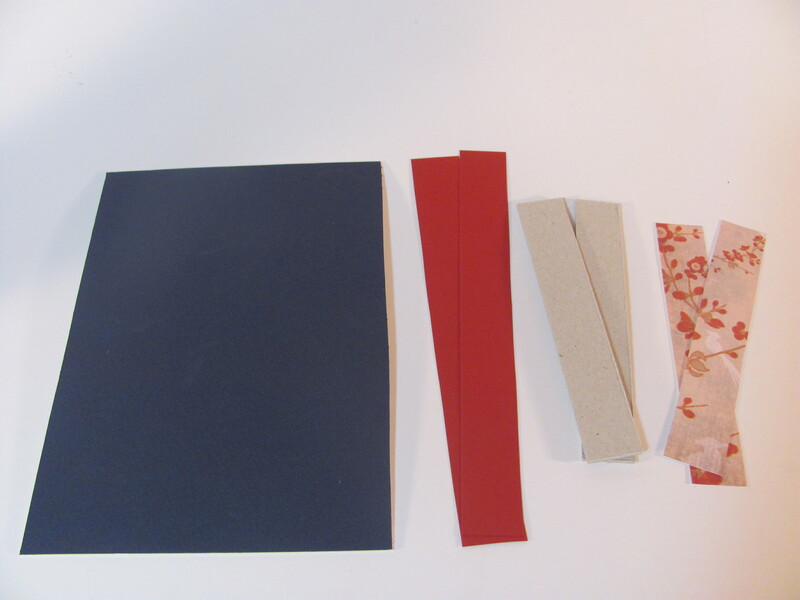 In my own studio, I have many sheets of mat board as well as scraps of decorative paper, and so I designed my own mat board looms for the residents of the assisted living facility. 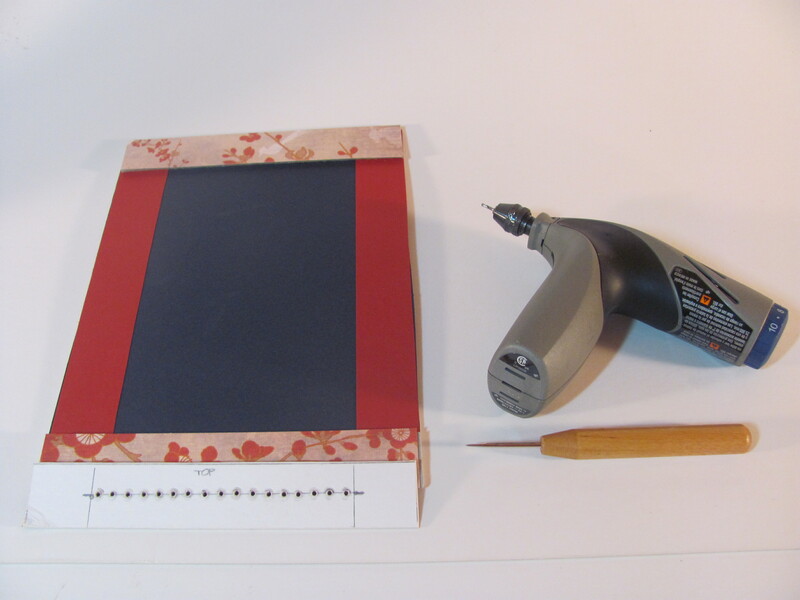 The looms were made from rectangles of mat board with a decorative frame of scrapbooking paper around the four edges. 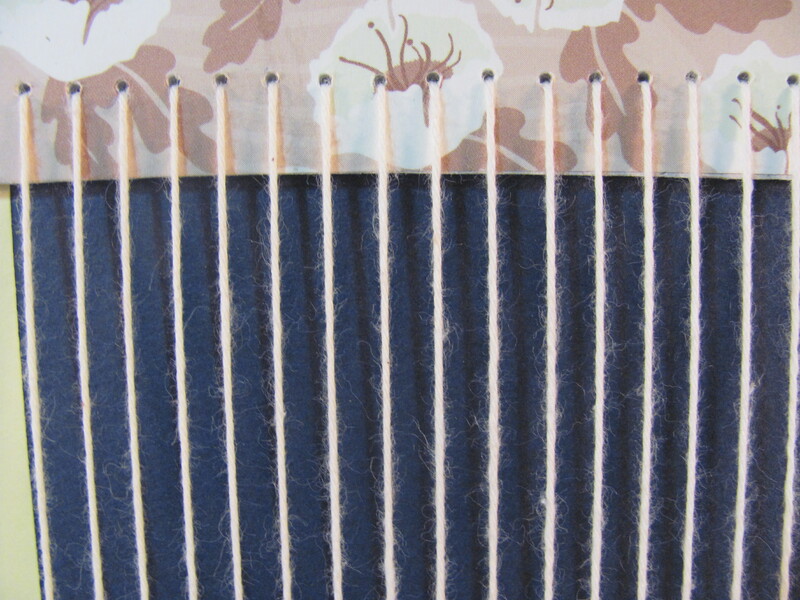 Carpet tacks were inserted at the top and the bottom of the boards and cotton carpet warp was wound around the tacks. 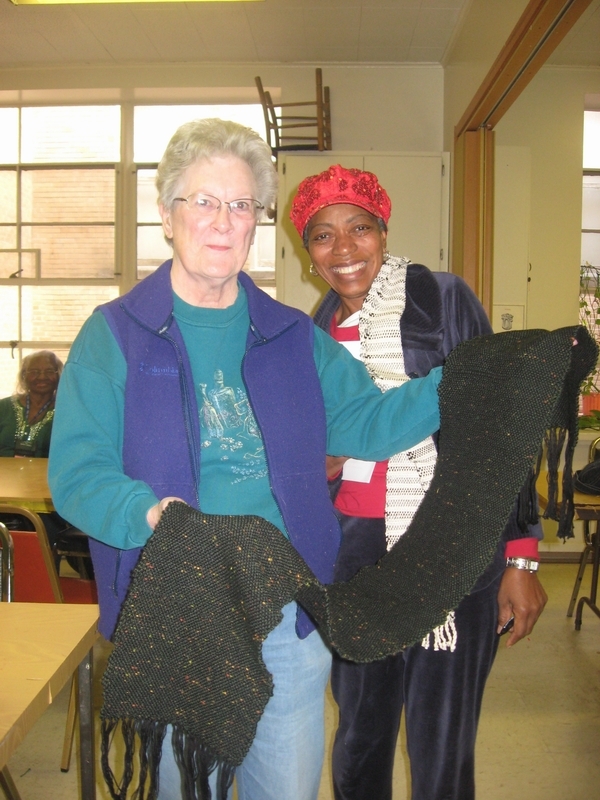 Students used a large wooden weaving needle and bulky novelty yarns in a variety of colors and textures to weave under and over the cotton warp threads. 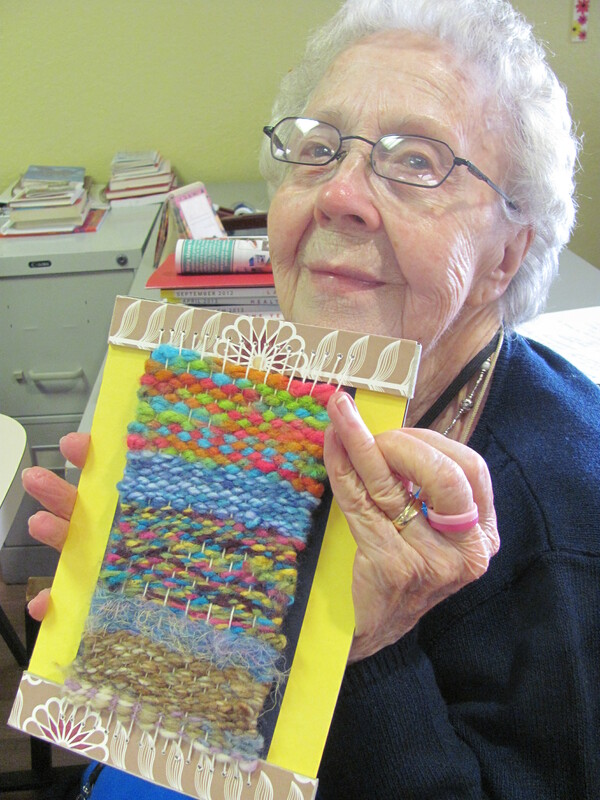 For some residents, I needed to begin the first row or two so that they could have a visual image of what their weaving would look like. Once they began a rhythm of weaving “under, over, under, over”, the class was well underway. 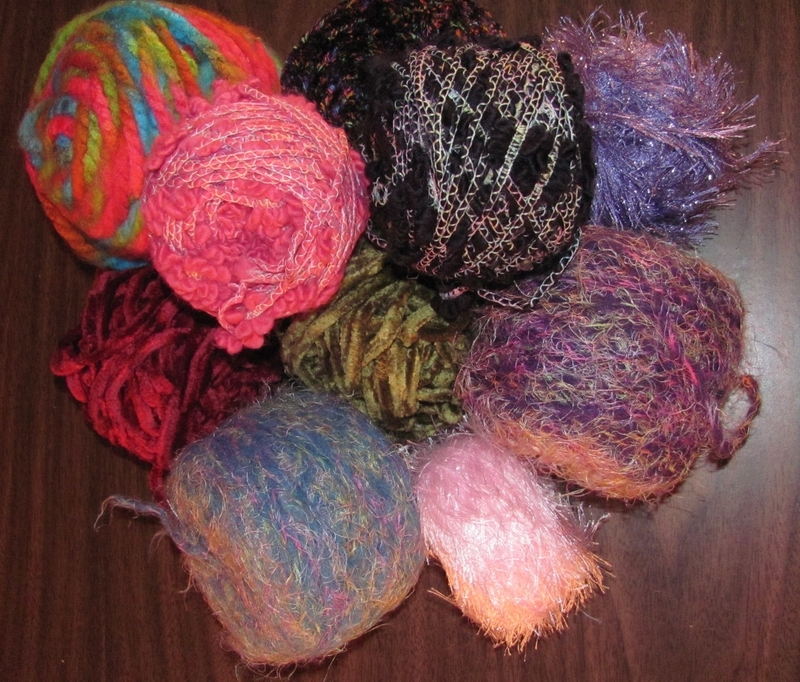 Students most appeared to enjoy the various textures and weights of the yarns, and the brightest and softest yarns were the most popular choices. Ten students joined me in this class and will continue to meet weekly for three more weeks. Many will be able to complete their projects by the end of this time. 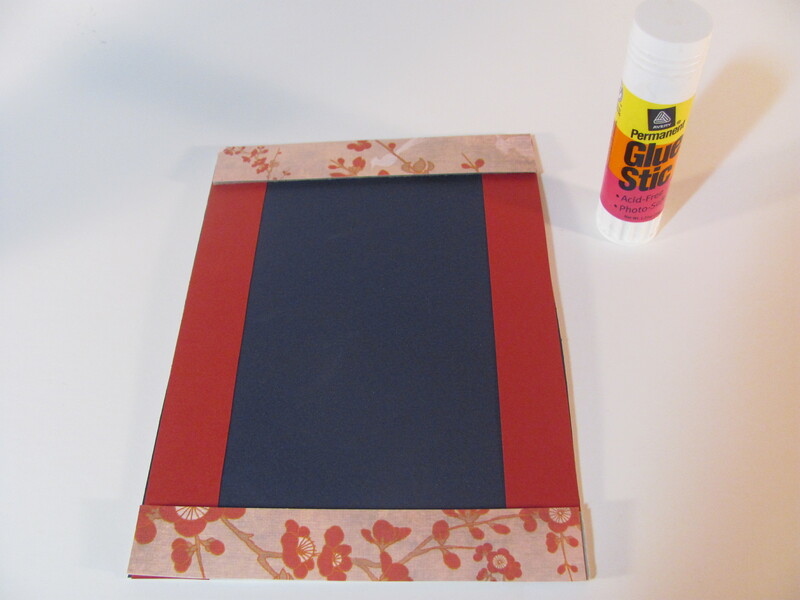 And the mat board loom will become part of their art creation, because their weaving will not have to be removed from it in order for their work to be displayed! 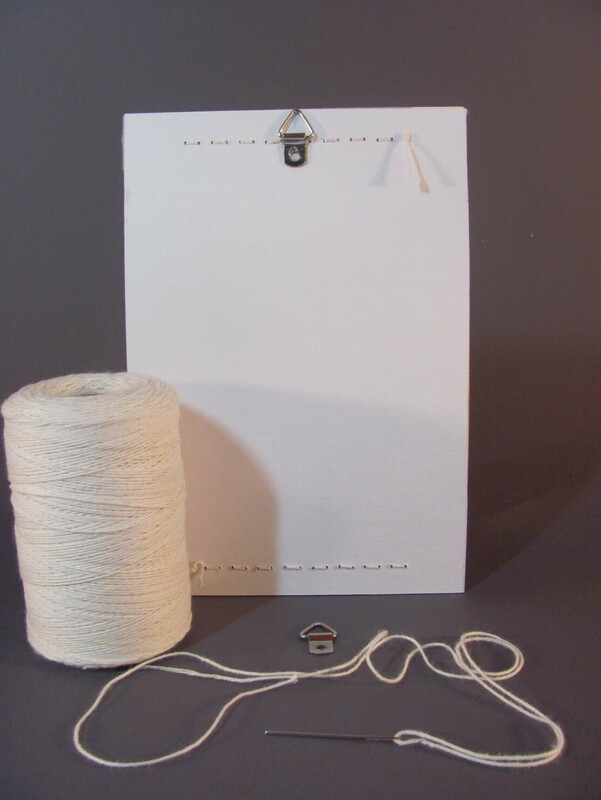 Whether or not they finish weaving, all will have a frame with a woven picture that they can proudly display, and know that they wove it themselves! November 1st already, and I haven’t entered a post for October. It has been a busy month. 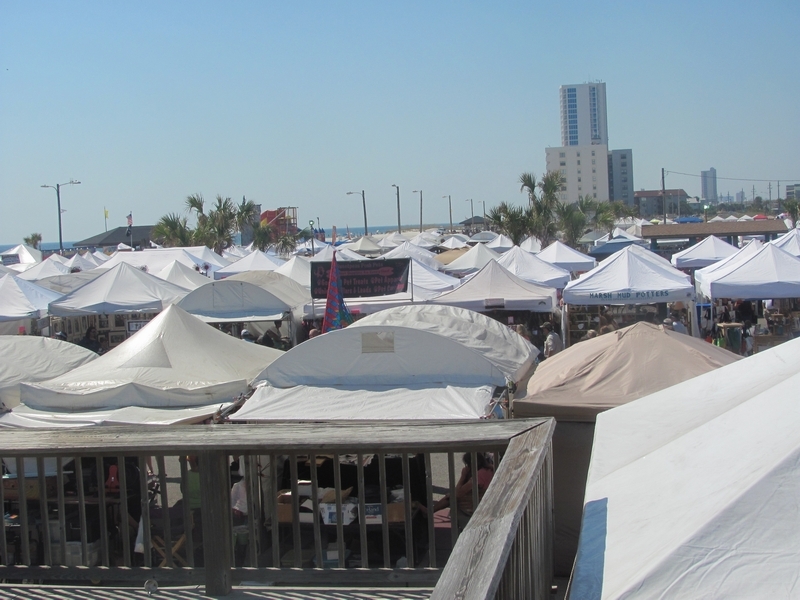 Some of the things that I have been doing this past month include teaching a weaving class at the Lewis Senior Center in Midtown Memphis, a three day art show and sale held in a private home in Germantown, a mini-reunion with a college classmate whom I haven’t seen in over ten years, a short break for R & R to the National Shrimp Festival in Orange Beach, AL, going to the season opener of the Memphis Grizzlies, and celebrating our 25th wedding anniversary. 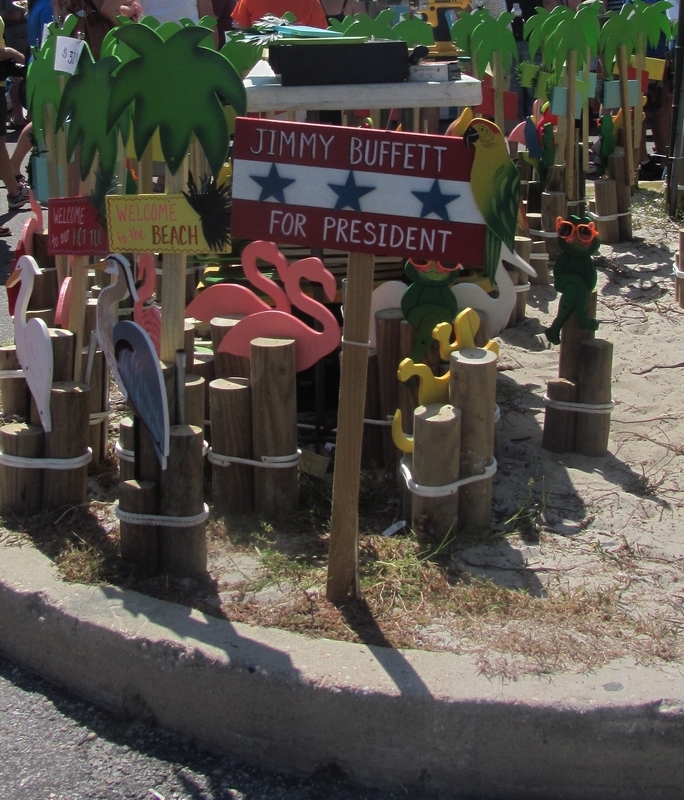 And here are a few photos of what went on in October. 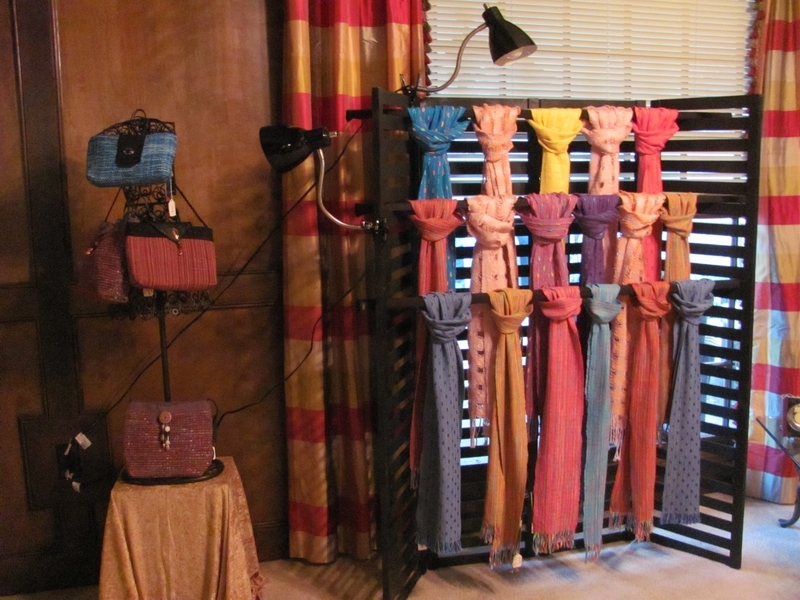 Display of my handwoven scarves and purses at "Kaleidoscope" an annual art show and sale in a private home in Germantown, TN. 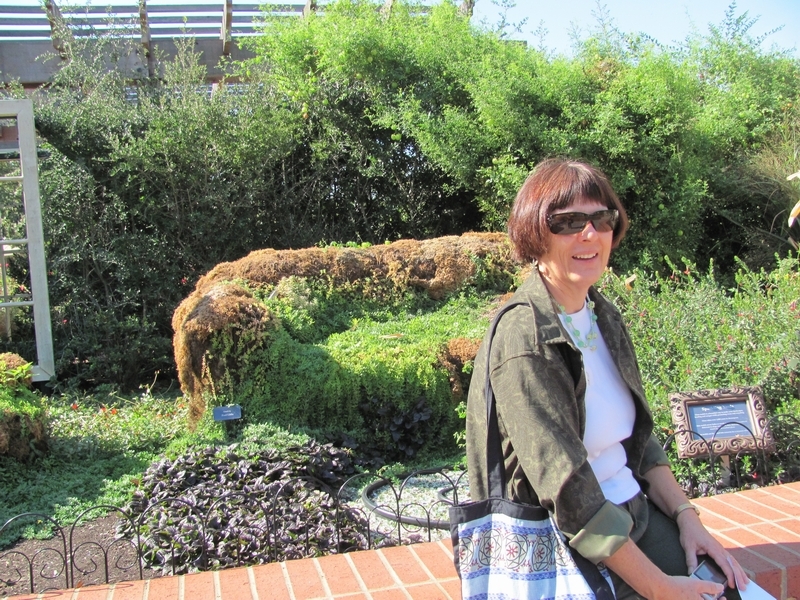 My college classmate, Betty visited me from the Washington, DC area and we spent a day at the Memphis Botanic Garden. 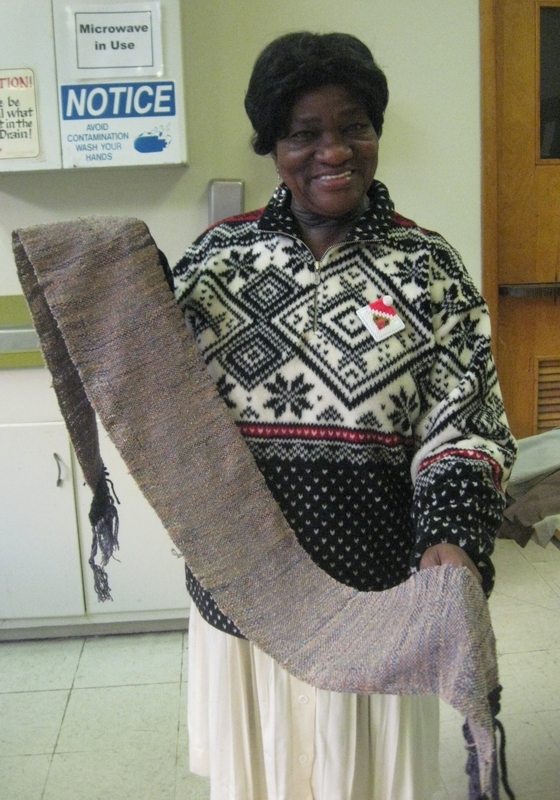 Irene, my weaving student at the Lewis Senior Center with two of her handwoven scarves woven on a rigid heddle loom. 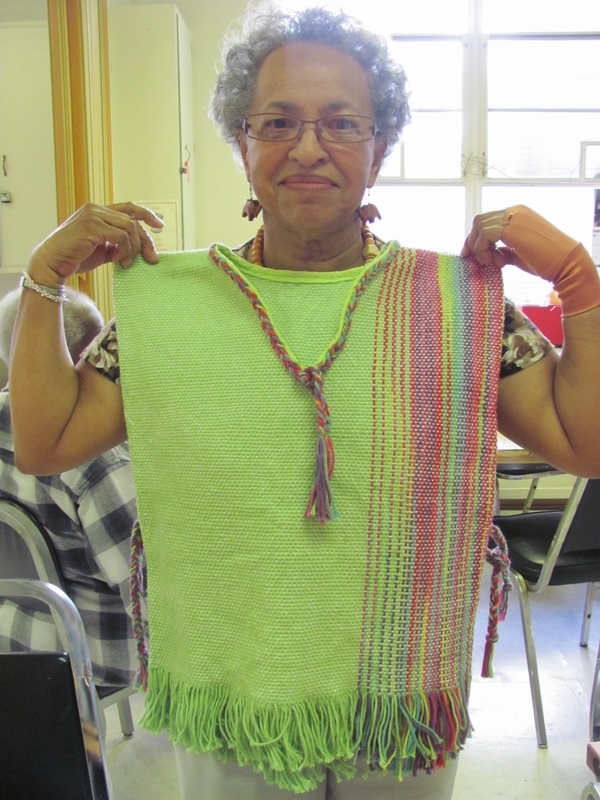 Bertha, my weaving student at the Lewis Senior Center with her handwoven vest woven on a rigid heddle loom. 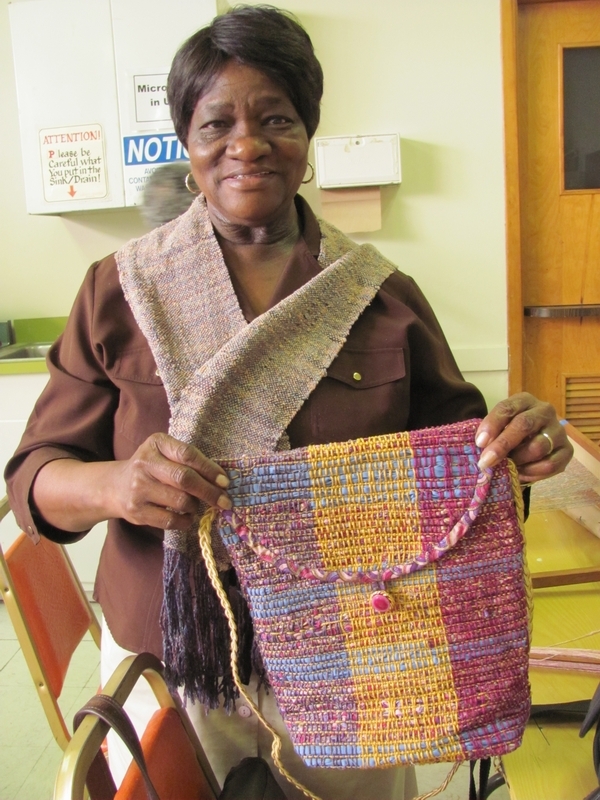 Katherine, my weaving student at the Lewis Senior Center with her handwoven scarf and purse woven on a rigid heddle loom. 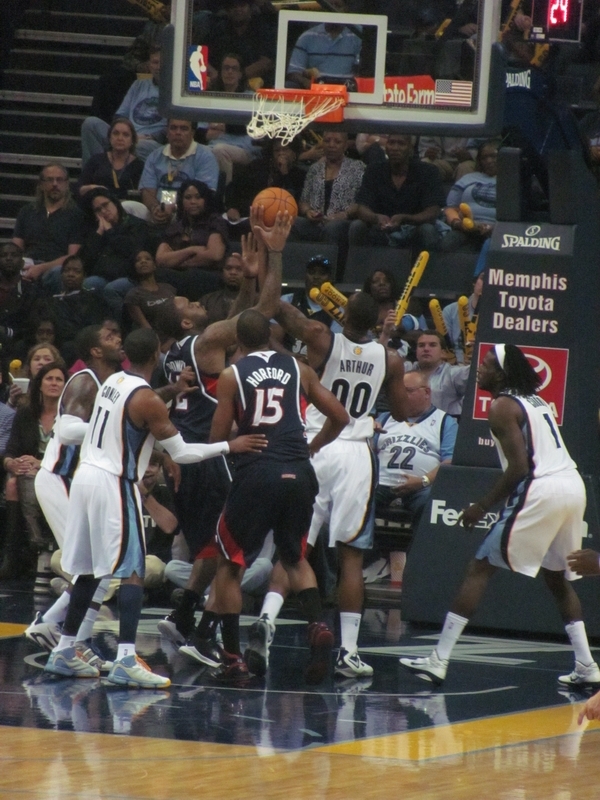 10th season opener of the Memphis Grizzlies at the FedEx Forum on October 27th which coincided with the 10th anniversary of our family's move to Memphis! 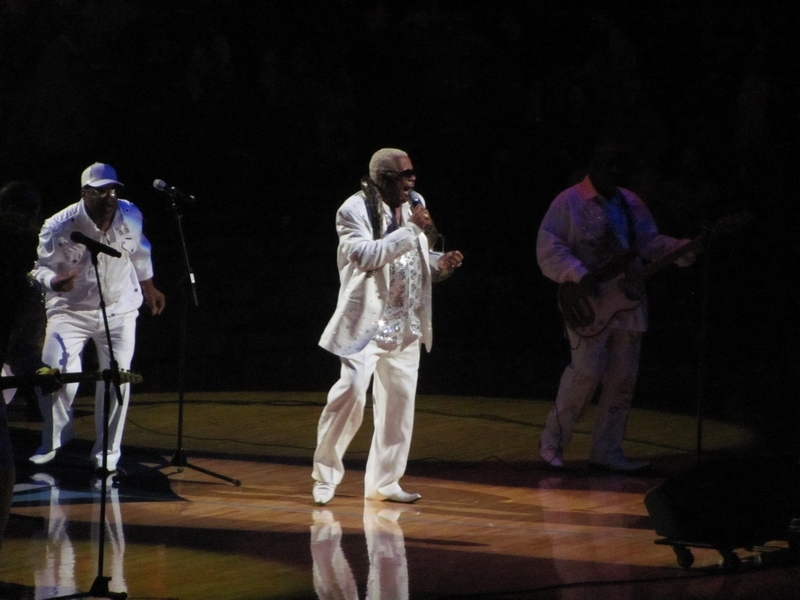 The Bar-Kays another Memphis institution performed at halftime. 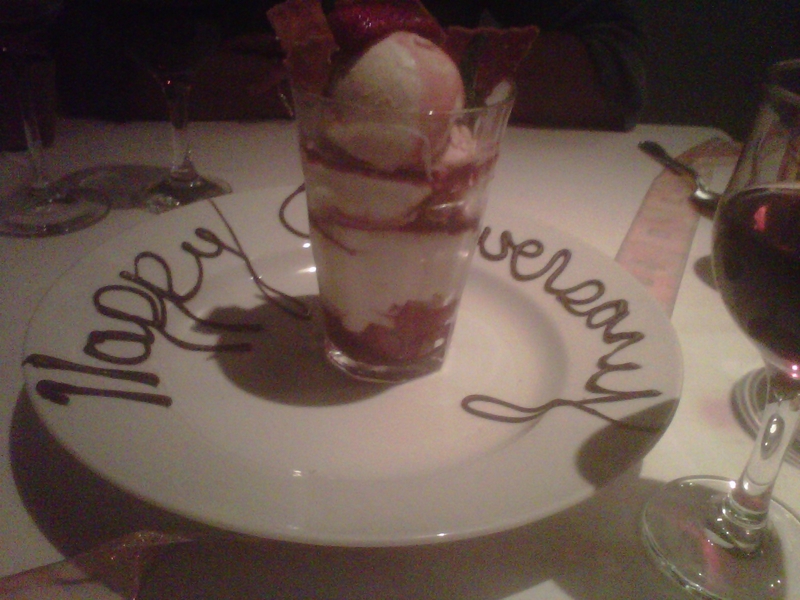 And we celebrated our 25th wedding anniversary at Restaurant Iris in Memphis! 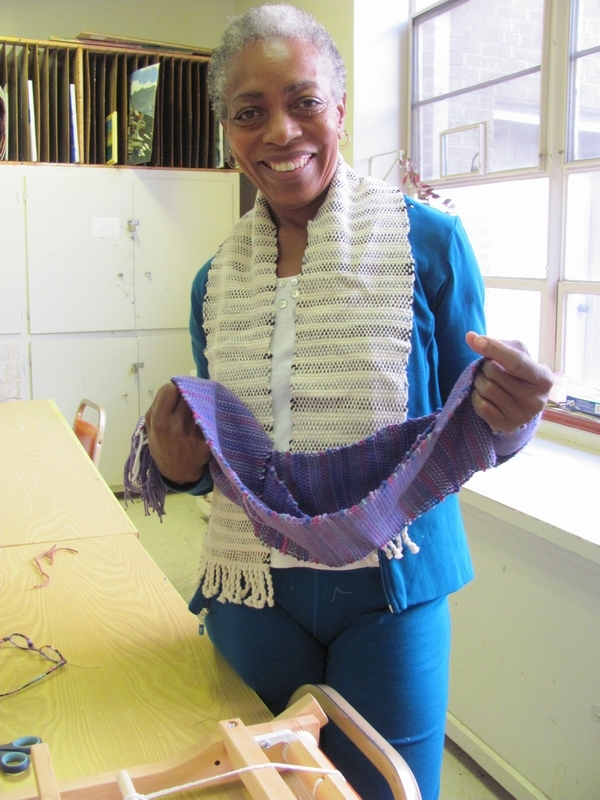 More weaving classes and more shows to come in the months ahead. 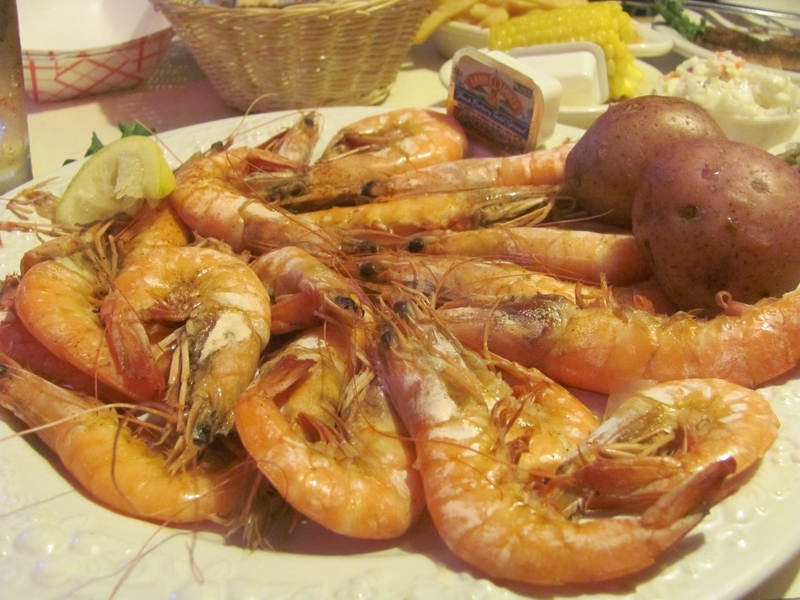 And also of course, more music, food, reunions, celebrations and winning games ahead as well. As the t-shirt says, “Life is Good”. 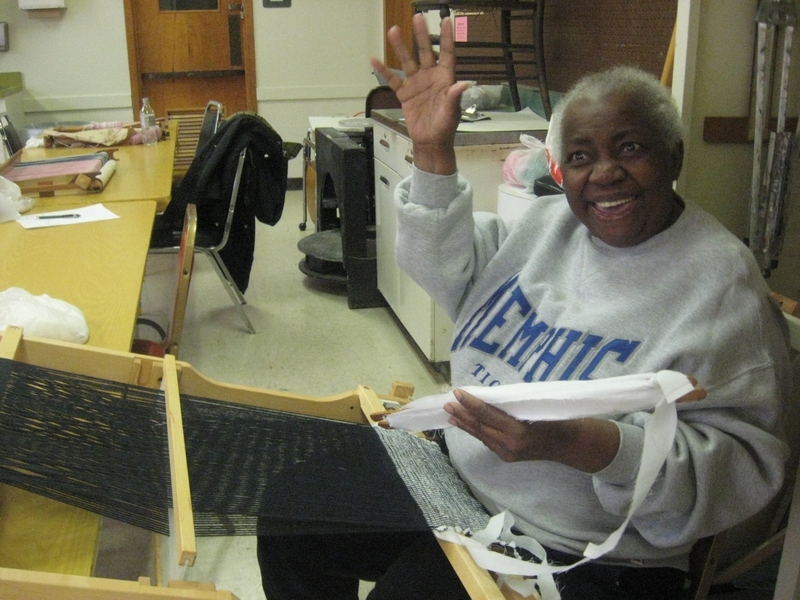 Fifteen students were registered to take the “Beginning Rigid Heddle Weaving” class I was teaching at the Lewis Senior Center of the Memphis Parks and Recreation Department. 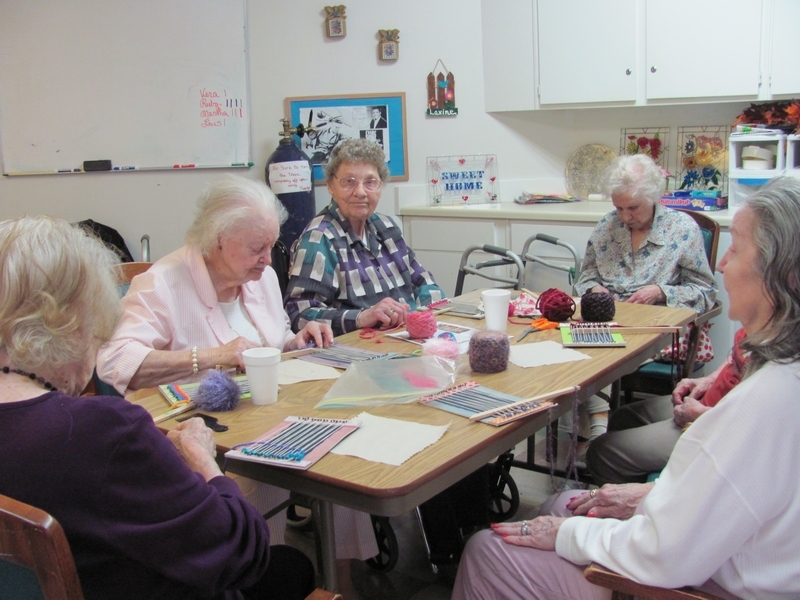 This class is funded by Creative Aging Midsouth, a non profit organization providing entertainment and arts workshops to senior citizens living in the communities of West Tennessee. 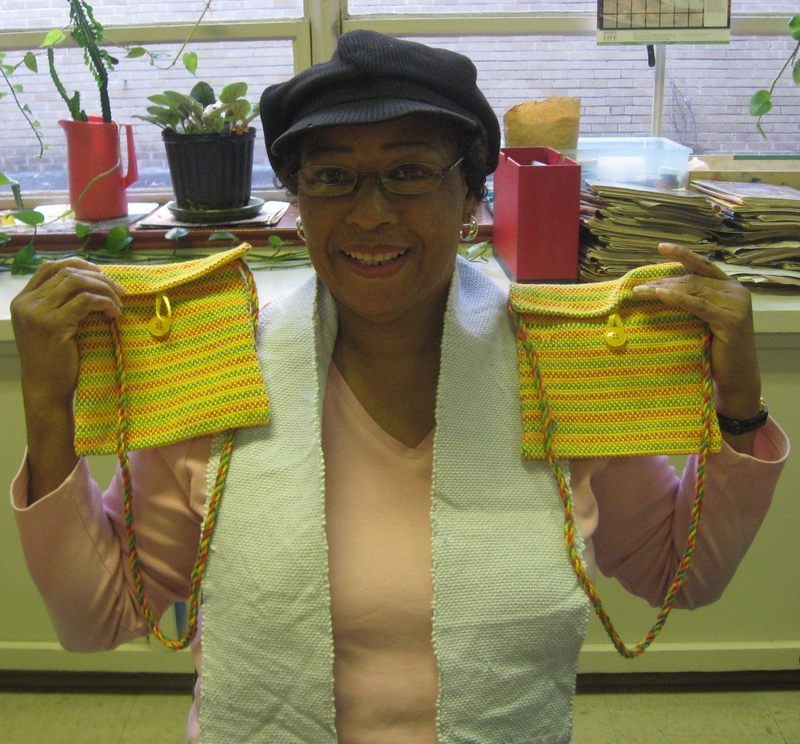 Many of the students had never woven before, but everyone completed at least one project which ranged from scarves to tote bags to mini purses to handbags made from rags or fabric strips. 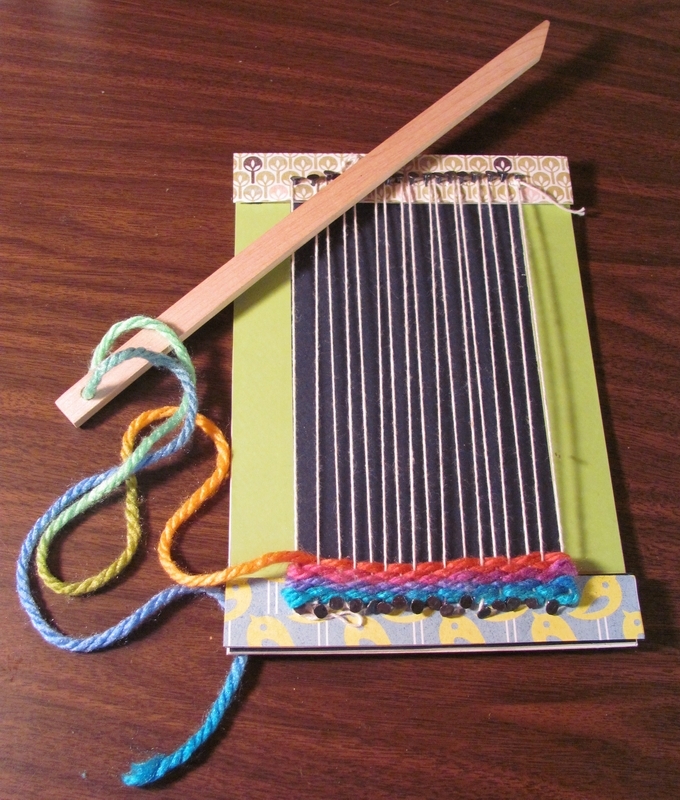 Students used both Beka and Schacht rigid heddle looms, and one student had her own Kromski “Fiddle”. Marty's third class project on her Kromski "Fiddle"
Everyone seemed to enjoy the class and they all were pleased with their finished projects. 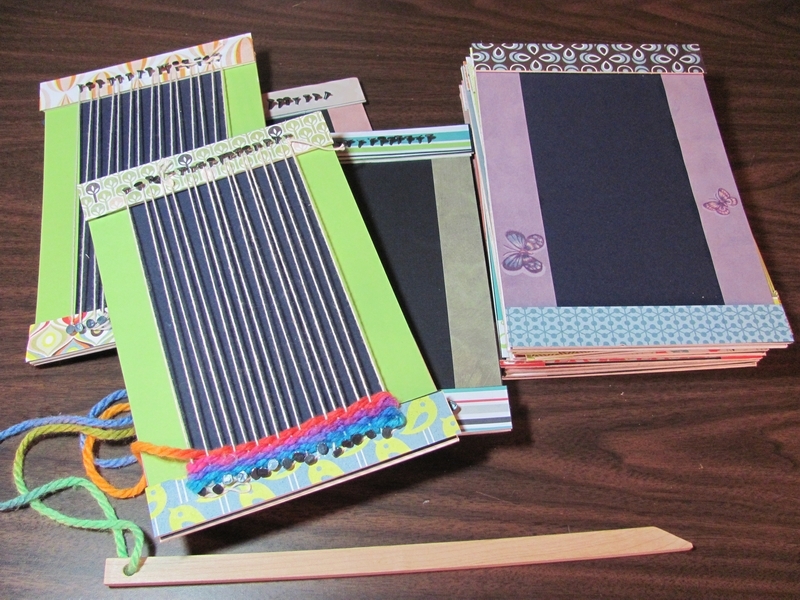 Several decided to purchase their own looms, and they all have requested another rigid heddle weaving class for early Spring. It really was a pleasure to weave with these ladies! My mother had a morbid way of looking at life. Basically she didn’t believe that life should be lived at all. We should all be locked up in china closets she would say to spare us the pain, hurt and humiliation that life has to offer. I guess for her the glass was always half empty. That also explains my youthful rebelliousness which thankfully continued into my adulthood. The rebelliousness, I mean, not necessarily the youth part. I can’t admit to ever living in a china closet, but some of my earliest handwoven clothes did, and still seem to be in residence there. Because the world seems to be shifting on its axis, or maybe it’s just me reaching a certain age, I decided to open the china closet and let these clothes live. I’m past the point of being mindful of what others think of me, so I won’t mind wearing some of these handwoven creations from the 1980’s! 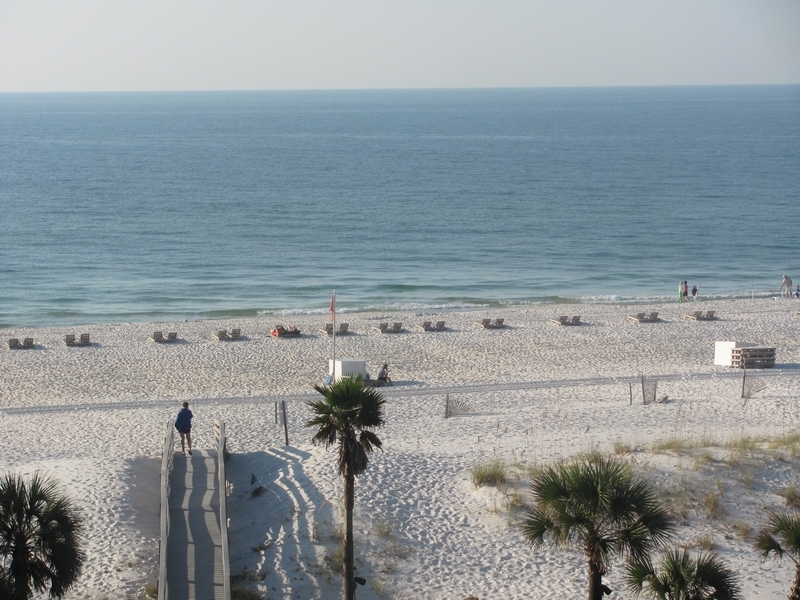 Only thing is, I live in a different climate now than I did thirty years ago! Almost everything I wove then was created with wool yarn – practical if one is living where temperatures were routinely below the freezing mark! 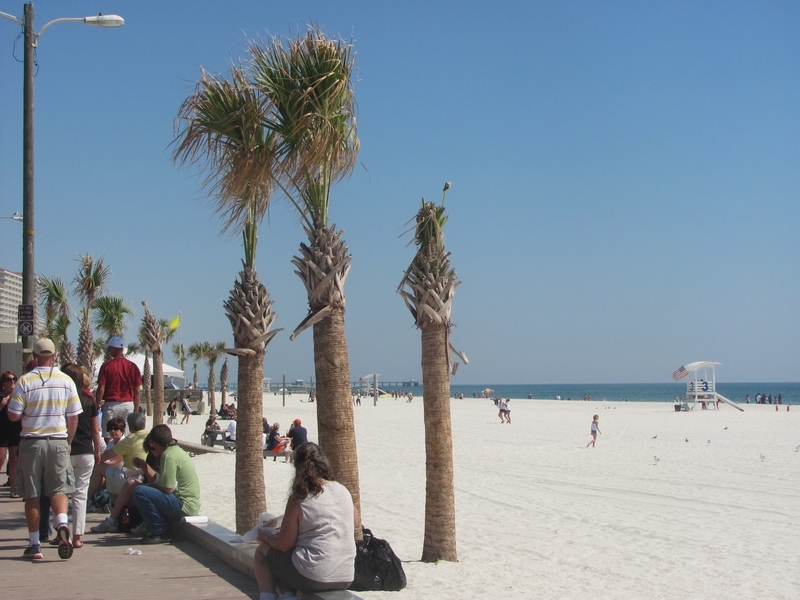 But here in Memphis it rarely gets that cold! 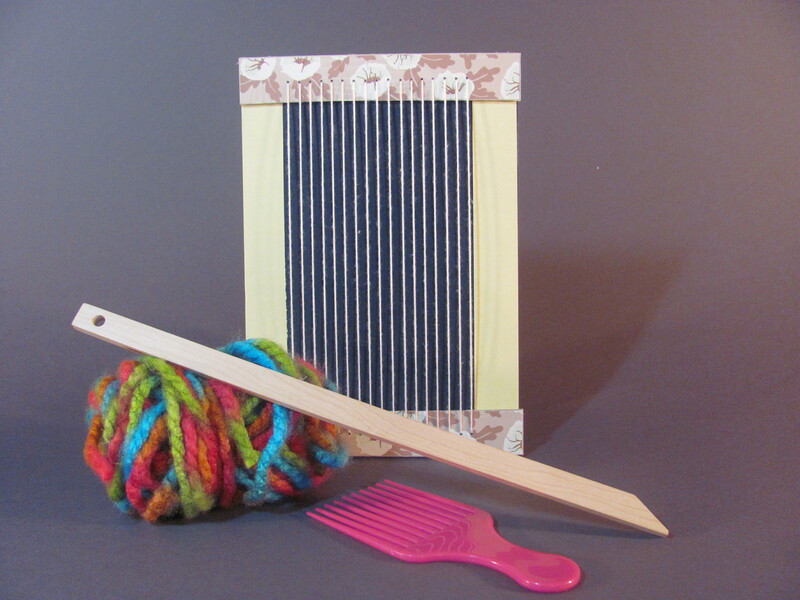 So, laugh if you must, but here are a few examples of my early work in weaving. 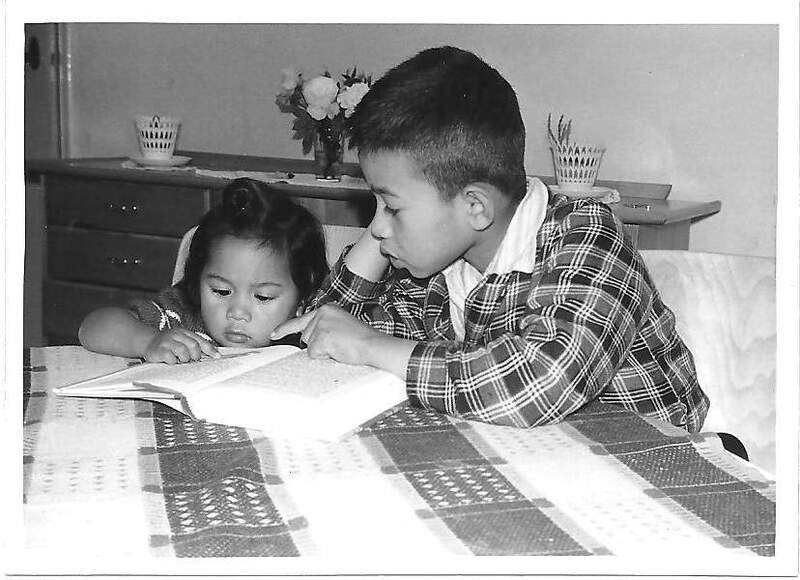 The huipil was one of the first pieces I ever wove. 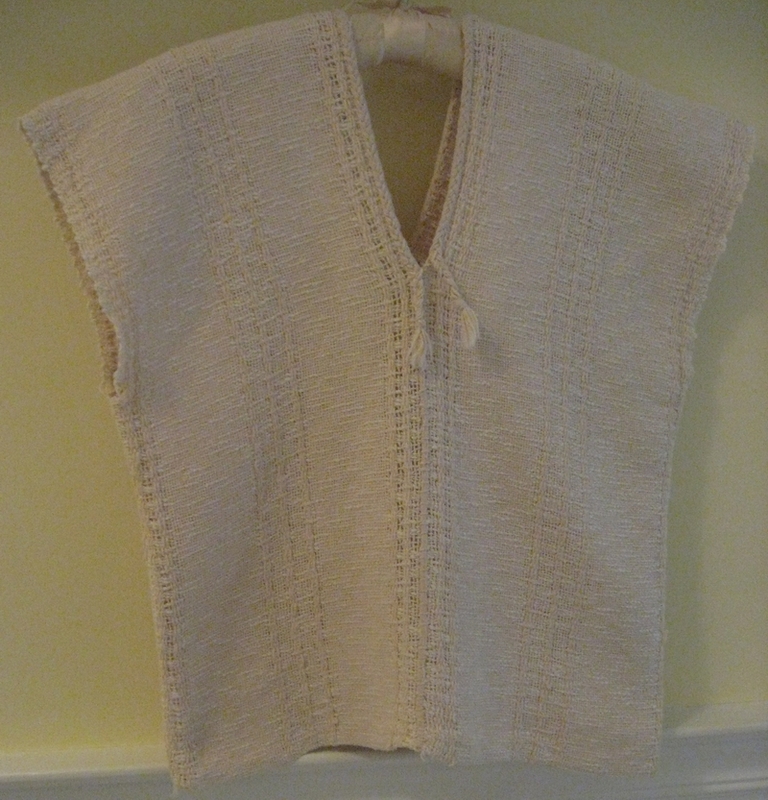 A huipil (wee-peel) is a traditional Guatemalan blouse usually woven on a back strap loom. 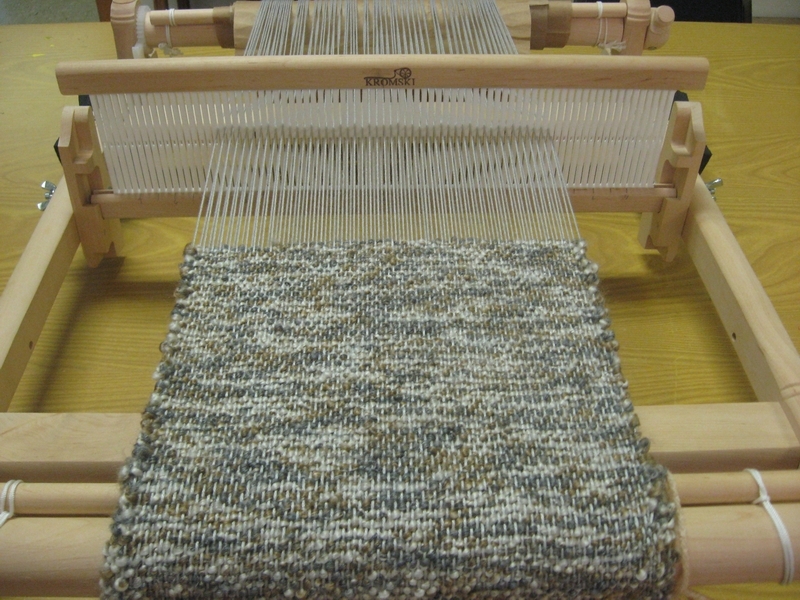 My huipil was woven on a rigid heddle loom threaded with cotton carpet warp and the weft was a nubby cotton slub yarn. The pattern was woven with a pick up stick. This is actually one of the few early handwoven pieces of clothing I can still wear in Memphis. Oy, what a geek I must have been to actually have worn this! 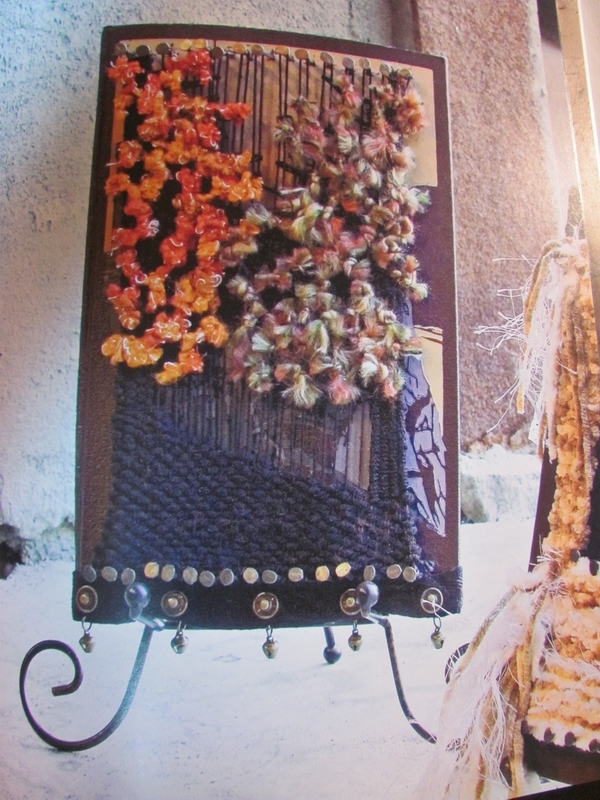 This was woven on my first floor loom – a Harrisville 40″ wide four harness loom that I built from a kit. 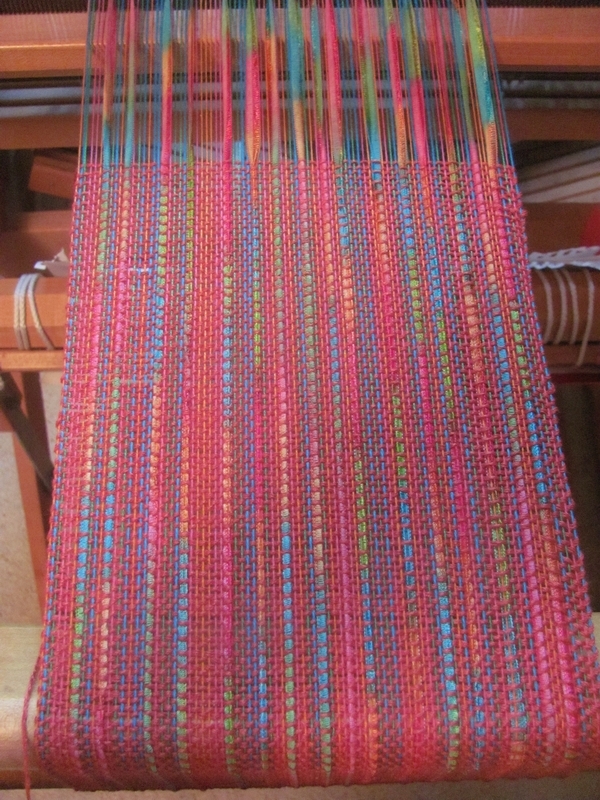 The warp and weft are both wool, the warp being a Harrisville Design single ply yarn, and the pattern weft was a beautiful 2 ply wool from Borg’s of Lund in Sweden. I remember how I loved wearing this jacket! 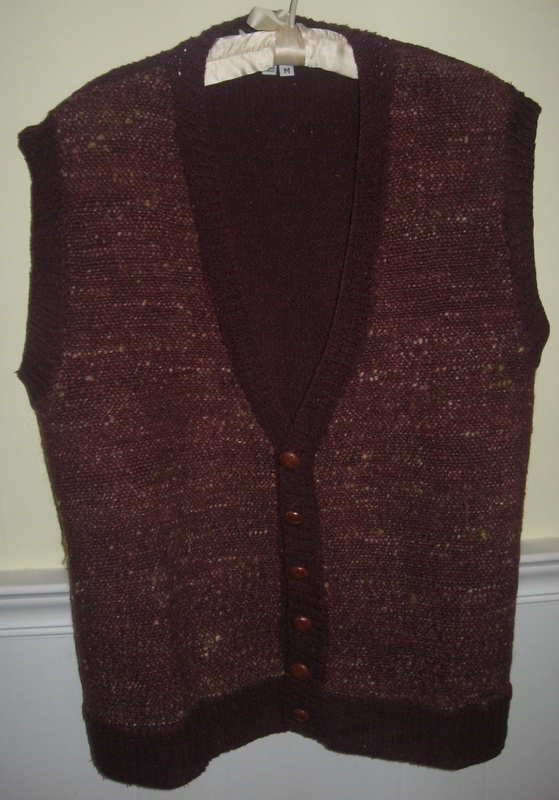 It was woven with 2 ply Harrisville wool yarns and sett at 8 epi. I remember walking on the finished fabric in a bathtub full of lukewarm soapy water to get it to felt the slightest bit! Since then, I’ve learned a little more about lining finished handwoven items! 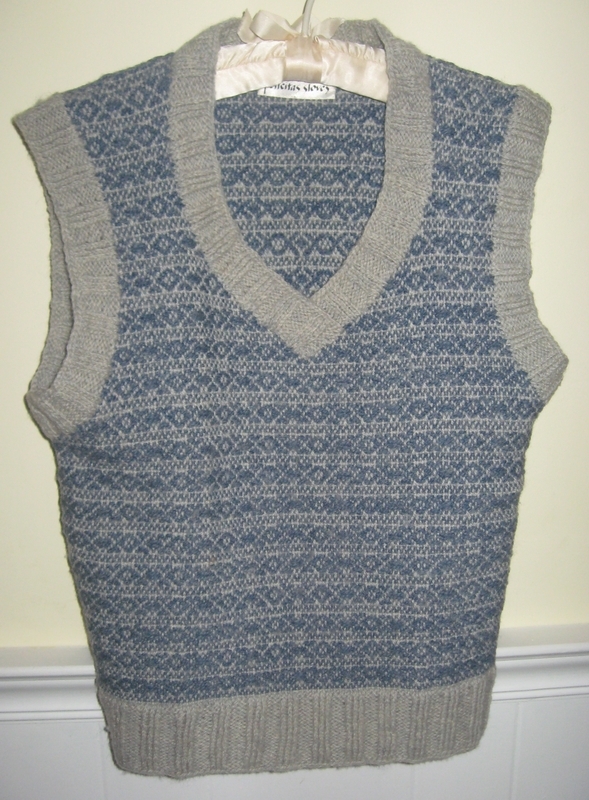 I can probably still wear this today – it resembles the swing sweaters that seem to be coming back into style. Another geeky sweater. 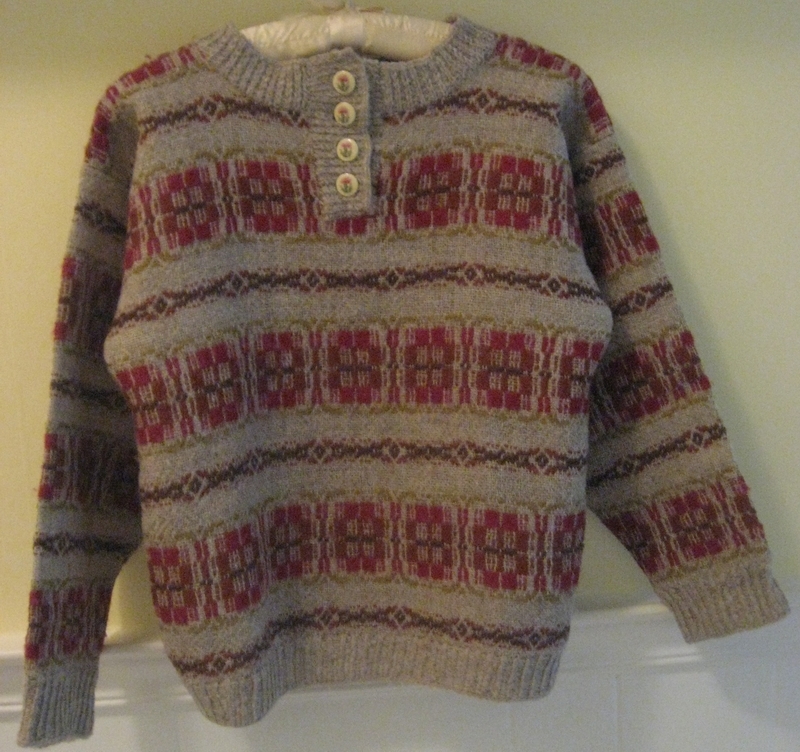 Woven in a twill plaid pattern with Harrisville Designs 2 ply wool. 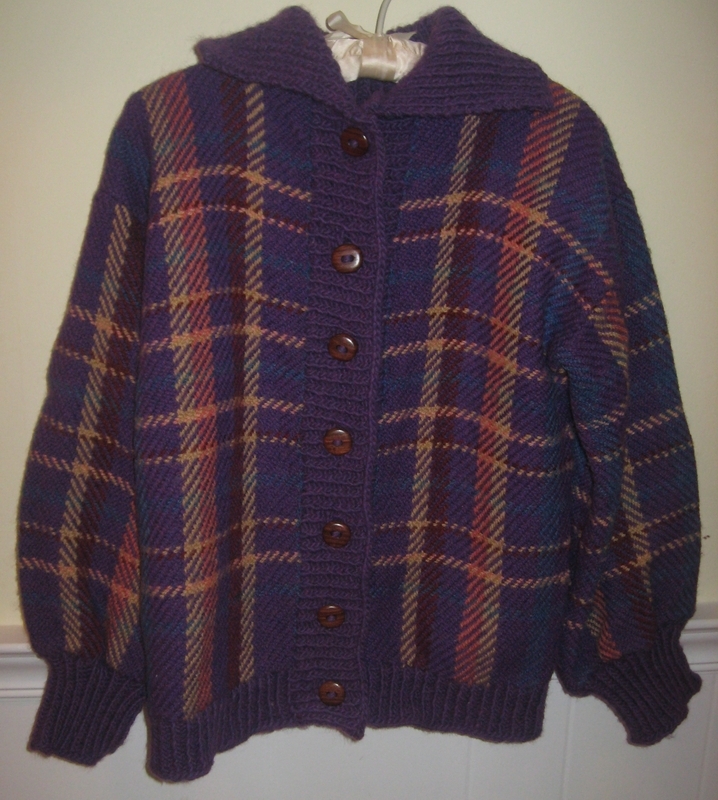 The cuffs, collar, buttoned front and bottom of this sweater as well as the overshot sweater above were hand knit by me as well. I wove this for the MAFA – Mid-Atlantic Fiber Association – Conference that was held in Glassboro, NJ in 1985. 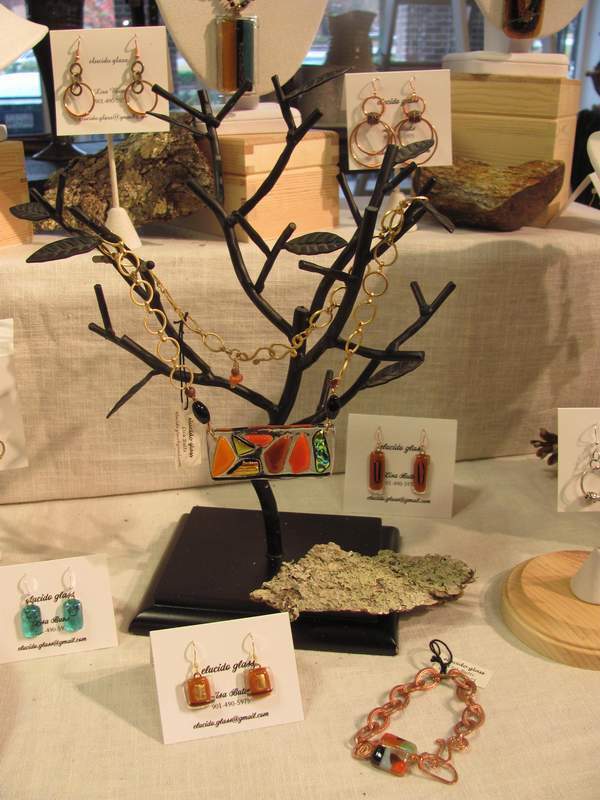 It was included in the fashion show which was presided over by Linda Ligon, the founder and creative director of Interweave Press. I learned to spin in 1988, and I remember splurging on this gorgeous batt of dyed burgundy wool blended with tussah silk noils. 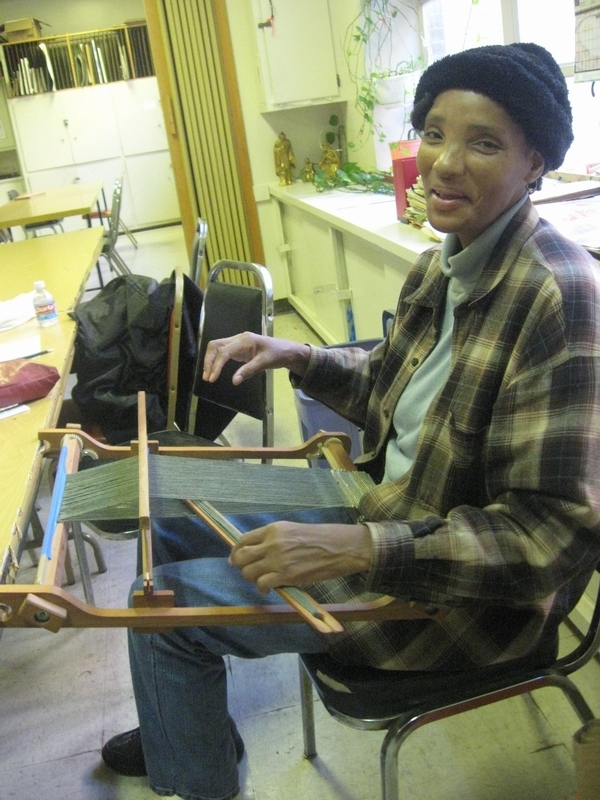 At the time I used to visit Linda Berry Walker’s farm, Wood’s Edge Wool Farm along the Delaware River in Stockton, NJ to purchase wool and batts for spinning. 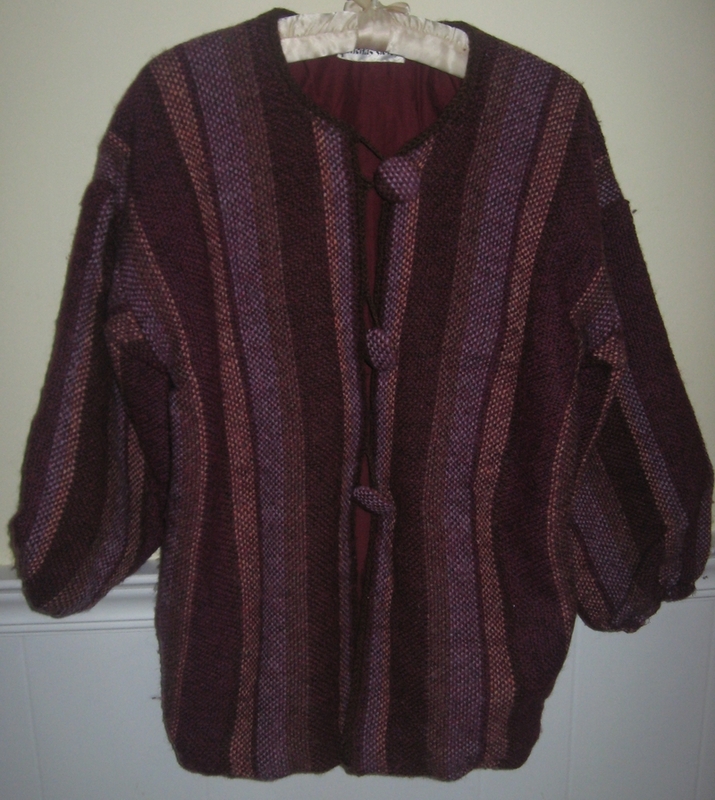 After spinning the yarn, I wove the front panels, then with an imported silk yarn, I knit the back, cuffs, front and bottom edges of the vest. This was finished in 1988 and as far as I can remember, the last major start to finish project I tackled. My first child was born in 1989! 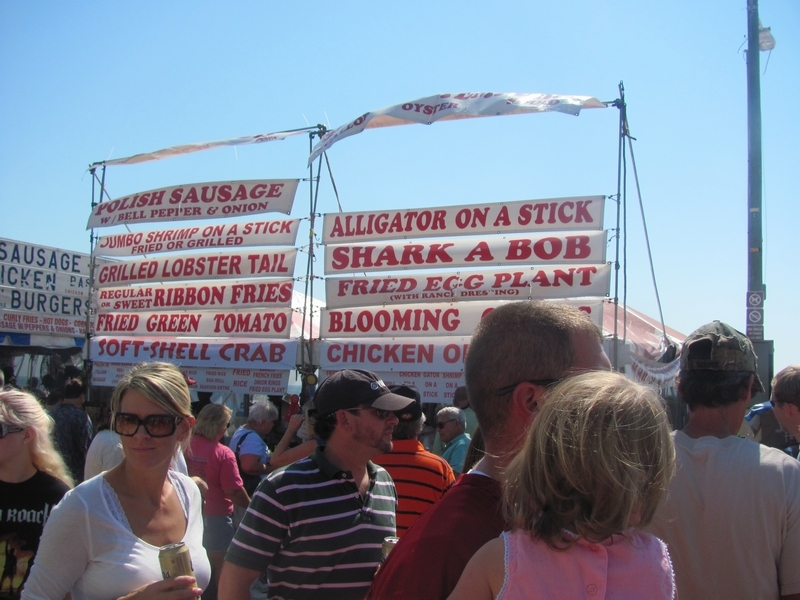 But today, I can probably wear the vest even in Memphis weather! So yes, I think it’s time that these vintage handwoven clothes come out of their china closet and start living again! As for my mother. She is 85 years old and living it up. Apparently she emerged from her own china closet about the time I left home when I was 18! I guess kids can do that to you.